Geneva/Aizawl, Jul 21 : President of Zo Reunification Organisation (ZoRO), R Thangmawia passed away in Geneva on Monday at around 12.45 (IST). Thangmawia left Aizawl on July 15 to attend the "8th Session of the Expert Mechanism on the Rights of Indigenous Peoples" in Palais des Nations, Geneva, Switzerland slated to be held from July 20 to 24, 2015. The cause of his dead is yet to be ascertained. He was 79. Thangmawia is well-known for his zeal in unifying all the Zo people— Chin-Kuki-Mizo-Zomi — who are divided by three international boundaries - India, Myanmar and Bangladesh- under one administrative unit. F Lalruatliana, coordinator of ZoRO Northern Zone said Thangmawia was the first-elected treasurer of ZoRO in 1988. He was elected as its president on July 17, 1991 and held this post till date. 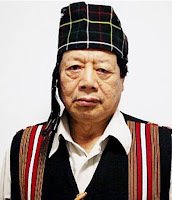 Mawia is said to have shared close rapport with Isak Chishi Swu, the chairman of National Socialist Council of Nagalim (Isak-Muivah/ NSCN-IM) during their college days in the late fifties. In those days, Mawia was pursuing a degree in Commerce (BCom) in Shillong and held the post of presidentship of Mizo Zirlai Pawl (Mizo Students Assn), and later became a scholar in Economics. "We are deeply saddened by his demise. We lost our great leader," said F Lalruatliana. In his hey days, Mawia visited China, South Korea, Thailand and German to promote the movement of ZoRO. He marched on foot from Jiribam (Manipur) to Makokchung, Nagaland which is a distance of about 600 kms, and from Makokchung to Moreh, a border town in India-Myanmar, about 400 kms during the Mizo Movement, in 1967. Thangmawia has never contested any MDC, MLA or MP elections during his life. Thangmawia was born in Maite village in 1936. He was survived by his wife, two daughters and a son. He lived in Aizawl Electric Veng.